ALFA’s Linda Behnken and Dan Falvey update listeners on two software workshops on bathymetric charting software with Nobletec, at the Sitka Sound Science Center on October 24 & 25. In addition, ALFA is sponsoring energy audits on fishing boats with a licensed marine engineer throughout the week. A workshop this Saturday, Oct 29, at noon in the Westmark Sitka will present data and ideas for efficiency discovered in the audits. And finally, there will be a series of workshops for longliners considering switching to pot gear, beginning at 10 AM on Friday Oct 28 and Saturday Oct 29 and running throughout the day. 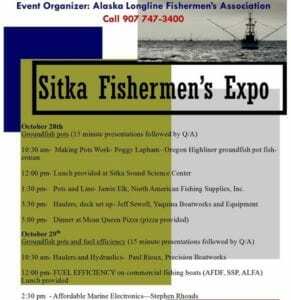 For complete information visit the Alaska Longline Fishermen’s Association online.